Lose all the noise of that ratcheting style locker without losing any of the performance! The No-Slip Traction System still uses side gears and couplers with teeth similar to the Lock-Right™, but special speed sensing devices allow the teeth to fully lock and unlock without any ratcheting or clicking. No clutch discs or friction plates to wear out, either! The No-Slip provides 100% traction when driving straight but fully unlocks during cornering, allowing for easy steering and reduced wear. Installs easily into your carrier, and most of the time the carrier can remain in the vehicle during installation. Made of Zytanium, a 9310 carbonized steel, for high strength and durability. 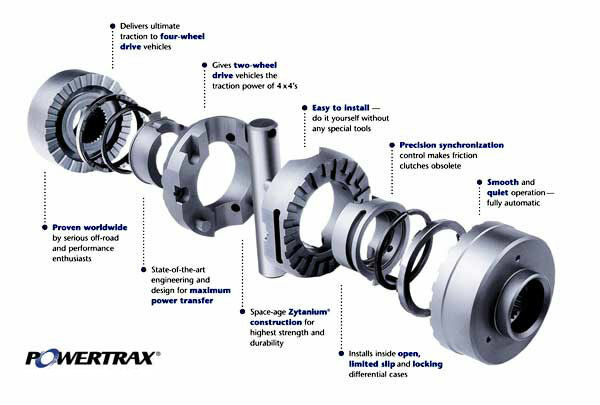 Applications for open and limited slip differential carriers are available. This locker includes a cross shaft which is retained in the differential case with a roll pin.